Earlier this year my friends and I were getting together every Monday to watch Insecure on HBO. We would get pizza, I would make cheese and chocolate fondue, and we would have a fun new cocktail! This cocktail was one of the most popular and all my friends asked me to make it over and over! I named it “Grateful” because this is the time of year we all get together with loved ones and friends and we reflect. We thank the people in our lives, we thank the opportunities we were given and we remember folks that are not able to celebrate with us this year. I am extremely grateful for being able to have a good job, friends that are extremely supportive and a family that cheers me on every step of the way! The fun part about this cocktail is the homemade citrus simple syrup I made! I used 1 part sugar, 1 part water and cooked it to a boil. 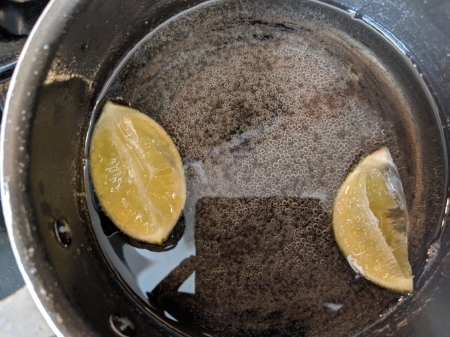 I squeezed the lime juice in the syrup and then tossed the whole lime in the pot. Turn off the heat and let the lime and syrup infuse and cool! Ta-Da! Once, you’ve got all the ingredients together it is a pretty simple pour them all into the shaker with ice and shake until cold! This cocktail is perfect for a get together or a Sunday brunch! What are your favorite holiday time cocktails?! Combine water and sugar and cook on stove until boiling. Sugar should be completely dissolved and mixture should be clear. Squeeze whole lime juice into mixture and placed lime into the pot. Turn heat off and let cool and lime infuse. Transfer to a airtight container or mason jar.